The gastronomic universe of truffles is about learning the peculiar approaches taken to fully enjoy them, the endless, passionate debates on how to eat them, the refined recipes, the anecdotes and very personal stories of those who have tasted them. It is an intimate, mysterious and inviting journey full of surprises. Simply put, truffles are unlike any other food one will ever encounter. The first contact, the first impression and certainly the most memorable quality of truffles it’s their fragrance. Truffles produce one of the most powerful aromas in nature; it is not rare for those who have been around truffles to use the words: intoxicating, unique, overwhelming, odd, to describe their peculiar smell. These words have such a strong sense… and yet they become an elusive concept when applied to the olfactory experience of truffles; other foods have compelling attributes that make them memorable but none of them seem to have the same —almost emotional— effect that truffles and their scent have on people. A quality that is intrinsically linked to their intense flavor and culinary value, a quality that makes them difficult to describe and at the same time unforgettable. Selecting a good truffle can make all the difference between an outstanding culinary experience and a total disappointment. Truffle selection is an acquired skill: it takes time to be able to recognize the best from the good, the good from the mediocre, the authentic from the fake, and so on. However, some basic notions can be rapidly learned. The smell is an important indicator on the maturity of a truffle: when they are immature there is little or no scent at all, when they are too mature they exude a repulsive odor. Then, one must pay attention to appearance and touching: a good truffle must be firm and never spongy. To find more detailed information, about the physical appearance of truffles as well as their seasons (including black winter truffles and other species) visit our Black Diamond, Truffle Seasons and Other Varieties sections. The smell is greatly responsible for the taste of truffles. Truffles enhance flavor and stimulate appetite, choosing which kind of truffle to eat and how to cook is largely a matter of personal taste, for example: someone can be very fond of white truffles and not like black truffles at all! And vice-versa! Knowing how their taste and aroma will infuse other foods is very important; this being said, the more a truffle is cooked the more fragrance it loses. 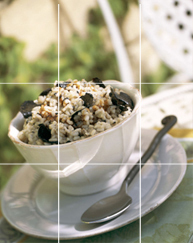 Truffles intensify the flavors of otherwise simple dishes, such as pasta, risotto or eggs. They must be used in small quantities, just a little shaving on a hot dish is all it takes to transform it and make it complex, the White Piedmont truffle is a great example of this and in fact, it should never be cooked: its white silky skin will release its wonderful aroma as soon as its shaved on top of the steaming plate. Perigord Black truffles can be either cooked (slightly) or eaten raw. Its robust fragrance prefers the temperatures of slow-cooked broth. A traditional way to enjoy them is on soft-boiled or scrambled eggs; previously kept for long hours in the same closed container as the truffles, getting impregnated with their aroma. Raw black winter truffles can be cut into thin slivers, smeared with butter and sprinkled with salt crystals. There is however some controversy regarding the very idea of cooking truffles. Some chefs are strongly against it (sometimes to the point of being radical!). One thing is for sure, tradition and myth are guaranteed to be present when it comes to eating truffles, whether they are cooked or raw. 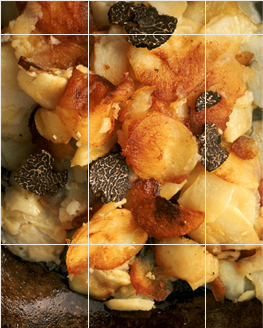 To enter the fascinating world of black truffle cooking at truffes.com, visit our Recipes section, and browse our exclusive selection of truffle products. Fresh truffles VS Preserved Truffles… Is one really better than the other? Fresh truffles are better of course! However, preserved truffles that have undergone the sterilization process only once and that are properly cooked, can be almost as good as fresh truffles. That being said, from November to February, if you can find fresh Truffles do not hesitate to buy them. How to choose a Fresh Truffle? When it comes to Périgord Black truffles —just like for any other vegetable— the most important thing is the maturity of the truffle. You must be careful with truffles harvested on early season, since they can sometimes lack of aroma. In contrast, the first truffles to reach maturity will be a true delight! The more mature the truffle is, the more compressed its white veins will be. Black truffles harvested in March are virtually black on the inside. There is also the shape, personally I tend to prefer truffles that are a bit crooked; I just find them better. After buying fresh truffles, how do we make the most out of them? A truffle is a reservoir of perfume… that fades out extremely fast. Thus it’s very important to do all the necessary to retain it; and first of all, a truffle should never be left out in the open air. How to preserve a truffle? 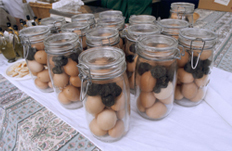 A good way to avoid oxidation is to put the truffles in duck fat inside a glass jar and store at room temperature. They can also be immersed in a light olive or raisin seed oil (or any other oil with a neutral flavor), inside the container the truffles need to be completely covered by oil, and the volume of oil should never be larger than the volume of truffles. 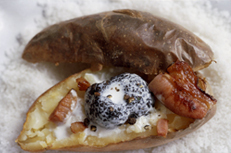 The container can be then refrigerated for up to two weeks. After the truffles are used, the wonderfully scented oil will be perfect for another use —a delicate touch in a salad, for example— in the near future. The oil should not be stored for too long. It is recommended to do so. The inside of the truffle is better than the outside. Do not throw away the peels though: put them in a jar with oil, they will be delicious on a salad. What kind of food goes better with truffles? Potatoes, eggs and pasta capture perfectly the powerful taste of truffles. You should also look for aromas and flavors that enhance its perfume such as garlic. What about truffles as a stuffing? They are good indeed, just be careful: truffles should never be used as stuffing for poultry… The odor would be unbearable. However, a few thin shavings on top of the skin will add a very nice perfume. Are there any precautions that should be taken when using with truffles?